After a near death experience at the end of 2010, Judith Kindler began to reflect on her life. Specifically, the many homes that she has lived in and varied experiences that have formed chapters in her life, each unique. 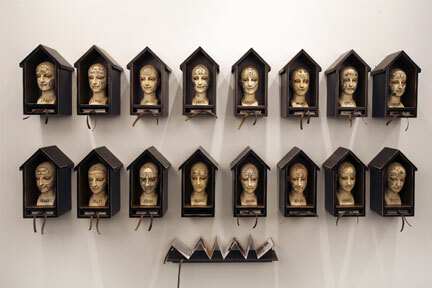 This prompted the artist to create an autobiographical major installation that places 16 Santos-like sculptural heads within 16 houses. Each house has a shelf upon which is placed a hand made book written by the artist with excerpts of her life. Zipcodes title each book and appear on the sculptures along with drawings on the heads referencing the illustrations in the books.. Beyond this cathartic signature work, Kindler proceeded to create two dimensional mixed media works all self referencial in content. The idea that when we go home after a hard day or a trip, for example, the feeling of having ones objects around and the comfort of one's own bed provide a tremendous sense of wellbeing and sanctuary. Some of the works look even further at the mind as our ultimate home.